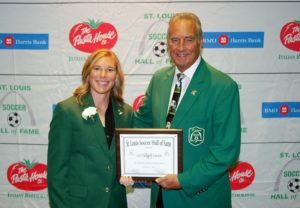 How fortunate is St. Louis to have Lori Chalupny Lawson be a part of our soccer community? Where does one begin describing Lori? Not too many individuals can say they have had a soccer field named in their honor, but at Nerinx Hall they did just that. Her successes as a NSCAA and Parade All-American her Junior and Senior years and her playing career was a sure fit for such an honor. On to the University of North Carolina, All ACC First Team, NSCAA Second Team and ACC All Freshman team in 2002, 2003 First Team All-American, 2004 and 2005 NSCAA MVP- All ACC First Team, NSCAA All-American, additionally in 05, Lori was named US Soccer Youth Female Athlete of the Year. Now on to an illustrious Professional and National team career. Being named to the 2007 WPSL All Star Team and in 2013, NWSL Best Eleven. National teams from U-16, U-19, and U-21 with a total of 35 caps led her to the Women National Team earning 106 caps. Team honors include 2002 U-19 World Cup Champions, 2007 World Cup 3rd place, 2008 Olympic Gold, 2009 2nd place Algrave Cup, 2014 2nd place International Football Tournament of Brasillia, and culminating with a 2014 FIFA World Cup Championship. Teams that Lori had played professionally include, River City F.C., St. Louis Athletico, Atlanta Best, Chicago Red Stars and a year in Sweden.